Papaya is filled with lots of health benefits. It is a powerhouse of several necessary minerals and vitamins. Besides, higher potassium content presence in papaya can moisturize your dry skin. We everybody wants to sustain a bright and glowing skin. But, for increasing pollution and temperature, it turns somewhat difficult to gain. Many people are spending lots of money on parlors to achieve soft, flexible and healthy skin. Going to the parlors for the beauty treatments may glow on your face; but, the products that are applied full of different chemicals. If you want to continue a glowing skin, without any chemical-disturbance, then make use of Papaya Face Pack at home to your rescue. Read More: Corn Face Mask: Make these 4 Natural Corn Face Packs at Home for Healthy and Glowing Skin. 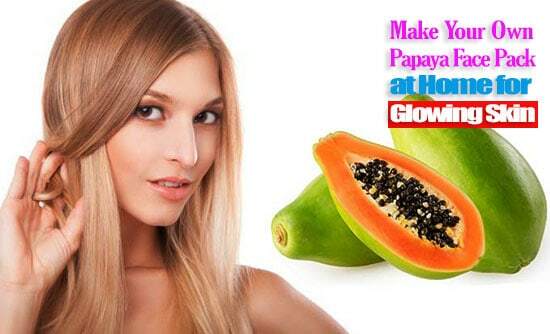 The mixture of honey and papaya can work like a miracle for the people with dry skin. From one side Honey can nourish your skin, on the other hand, the useful enzymes in papaya pulp can release the pores and clean your skin. To prepare this honey and papaya face pack for dry skin, you will need 1/2 teaspoon of honey, 100 grams of ripe papaya pulp, and 1/2 teaspoon of lemon juice. Mix all the ingredients until it turns into a smooth consistency. Then, use this face pack over your face lightly and leave them to dry for ten minutes. Wash off using cold water and see the results. You can use this face pack two times daily. The mixture of orange and papaya face pack can work like a miracle for the people with oily skin. Dear viewers, do you know why is this face-pack perfect for the people with oily skin? The main reason is that the presence of natural astringent in orange, which can decrease oil on the skin. The mixture of these two ingredients could keep skin spots at bay. Take three tablespoons of orange juice and a cup of ripe papaya pulps in a small bowl. Mix them properly and use it over your face. Leave them for 15 minutes and wash it off using water. Pat dry using a clean towel. Then use your favorite apply moisturizer on your skin. See the result! If you desire a nourished and glowing skin, this face-pack is perfect for you. Banana, Cucumber, and Papaya can give your skin hydrating, refreshing, and comforting effect. All you need to blend 3 three ingredients into a blender for making a smooth paste. Then use it over your face and neck lightly. Leave them for 10-15 minutes and wash off using warm water. Pat dry using a clean towel. Then use your favorite apply moisturizer on your skin. See the result!